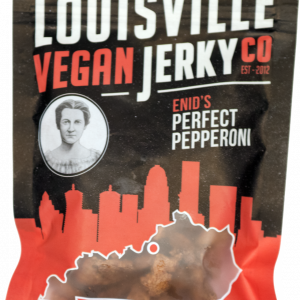 Louisville Vegan Jerky Bourbon Smoked Spicy Chipotle is a non-GMO soy jerky, marinated and slow dried. Subtly sweetened with real Kentucky sorghum, tossed in Chipotle pepper for medium heat. Bite size pieces. Medium chew. Louisville Bourbon Smoked Chipotle Vegan Jerky is a handcrafted vegan jerky, with 12 grams of non-GMO soy protein per bag and gluten free. Ingredients: Textured soy protein, sorghum, olive oil, tomato concentrate, vinegar, onion, garlic, ancho chili powder, chipotle powder, red pepper flakes, spices, salt, sugar, natural flavors, bourbon whiskey extract. 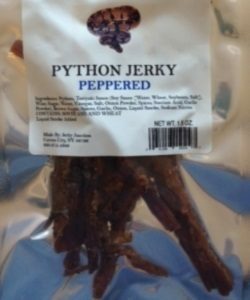 Louisville Perfect Pepperoni is a non-GMO soy jerky, marinated and slow dried. Savory pepperoni with a little peppery kick. Bite size pieces. Medium chew. 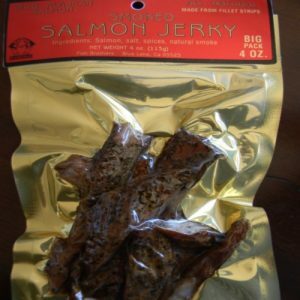 Wild Alaskan Smoked Salmon Jerky is smoked with all-natural Hickory wood smoke and covered with a layer ground black pepper. Flavor – Sushi grade, wild caught Alaskan Salmon. Reminiscent of Smoked Salmon!